Environmental Protection Agency (EPA) Administrator Scott Pruitt met with lawyers seeking to prioritize the cleanup of a water district in Orange County, CA, at the behest of MSNBC personality and radio host Hugh Hewitt, one of Pruitt’s staunchest media defenders, according to a Politico story published May 7. The lawyers worked for the same firm, Larson O'Brien, as Hewitt. “Six weeks after that meeting, ... the Orange County North Basin site appeared on Pruitt’s list of 21 contaminated areas to address,” Politico reported. 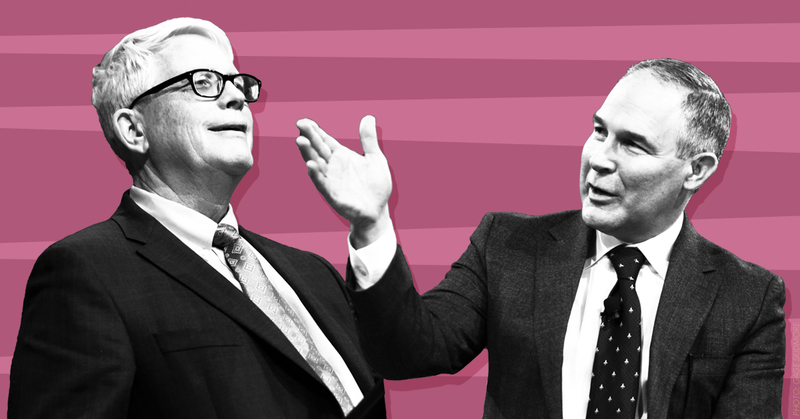 Media Matters has noted Hewitt’s full-throated defense  of Pruitt amid a litany of scandals and controversies, including  his exorbitant travel and ethically dubious condo lease, on MSNBC and his radio show, which Pruitt has appeared on at least a dozen times, according to Hewitt . The story also noted that Hewitt’s son James works  in the EPA’s press shop. The Washington Post had reported in April that Pruitt used an obscure provision  in a water-safety law to hire James, among others.